The BS Aquino administration is in many ways botching the single-biggest chance to tell the world that “its more fun in the Philippines. The last time a pope visited the Philippines was exactly 20 years ago. It didn’t matter that the President was a Protestant. It didn’t matter that we still didn’t have much to show, except for the vibrant and zealous faith of the Filipino. What mattered most was that that the Leader of the Catholic Church and Head of State of Vatican City was coming, and that he was holding the World Youth Day here in the country. And so in 1995, Manila exploded into the biggest Papal fiesta the Vatican had never seen. Hundreds of thousands lined up the streets to welcome Pope John Paul II from the airport to the Apostolic Nunciature. Hundreds of thousands more everywhere he went. Both the Catholic Church hierarchy and the Ramos administration called on the public with a single message: Celebrate with the Pope wherever he goes. And celebrate the Filipinos did. In their millions. And there were thousands of young people from all over the world who joined Filipinos and Pope John Paul II at that time. They were safe and happy in the company and care of Filipino hosts from across the country. The World Youth Day 1995 was a smashing success. When Pope John Paul II went to Luneta, the biggest problem was how to “catapult” him from Quirino Avenue to the grandstand. The sheer number of people gathered to hear him say mass was extraordinary even for the standards of the majority-Catholic Philippines. Authorities had to use a helicopter to make that Papal mass happen. That Papal Mass at the Luneta put the Philippines in the history books of the Vatican and the world: The single biggest crowd for an outdoor Mass ever held by a Pope, thanks to five million Filipinos who wanted to “tell the world of His Love”. 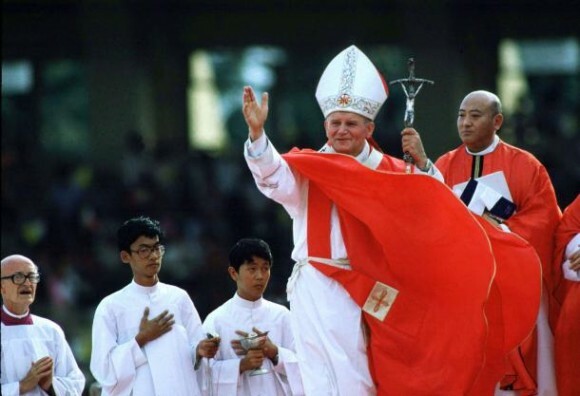 It was no surprise that in his departure statement, Pope John Paul II could not hide his happiness that he visited the Philippines. I bring with me a thousand images of the Filipino people. Much later, we found out that the Ramos administration successfully stopped an international assassination attempt against Pope John Paul II. Lesser mortals in government would have used that to get as much publicity before and during the event, but no one ever did. The media-savvy Ramos knew better than to scare the Papal delegation, the international media and the general public – and thereby affect the climate of joy that enveloped the Papal visit. And it would not have helped him, a former general, and his and the nation’s reputation. Fast forward to 2015: If Pope Francis was welcomed by elephants and a 21-cannon salute in Sri Lanka, different animals are set to do the same in the Philippines: crocodiles and pigs donned in formal wear. By crocodiles and pigs, we mean the highest government officials who for the past two years had been exposed to have been using public funds for private gain: PDAF for lawmakers, DAP for the President himself and “cuts” for their partners-in-crime. Young Filipinos, led by the Student Christian Movement, throw colored powder in the air as they prepare a joyous welcome for Pope Francis. Photo from Yahoo Philippines. No one begrudges the government of its obligation to protect Pope Francis in his state and pastoral visit to the Philippines. But it is totally different how the BS Aquino administration is doing it, going overboard and seems intent on emerging as the party pooper for DJ Pontifex’s rockstar appearances in Manila and Tacloban. Catholics, of course, know and believe he should be protected as much as possible. We Catholics offer in every Mass special prayers for the pope, praying both for his safety and for his intentions. The streets are likewise peaceful and Catholic homes cannot hide the sense of glee over the fact that the world leader of the church is coming to the country. Talking about the Papal visit, we hear President BS Aquino addressing the people using the language of fear. The word “stampede” is bandied about by the President and his sycophants in the Palace. As if Catholics are planning and plotting to actually crush the pope or themselves. The Catholic leaders have asked people who live along the routes of Papal motorcades to go out and welcome the pope when he passes by. But the authorities said no one should be on the second floors of their houses, no one could go on the roofs of their houses. In Tacloban, the ban on going up the roofs of houses cannot simply be made. Many still live in tents and makeshift houses. The pope himself would see the tents and the temporary dwellings when his plane prepares for touchdown at the airport. It should not be a surprise that the President is not joining the Pope in his visit to Tacloban: Tacloban is a sticky subject and traumatic place for the President – but for reasons totally different from those of Haiyan’s survivors. He has refused to go back to the Haiyan-devastated city, scared shitless by survivors incensed by his incompetence, monumental lack of compassion, his underlings’ corruption of taxpayer funds for relief and rehabilitation, and his petty political war against their mayor. 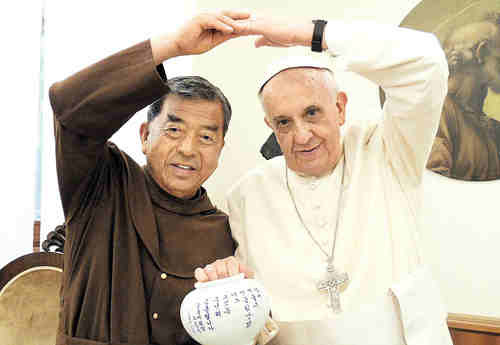 If he goes along with the Pope to Tacloban, the mass could easily turn into a protest beamed nationwide and worldwide. 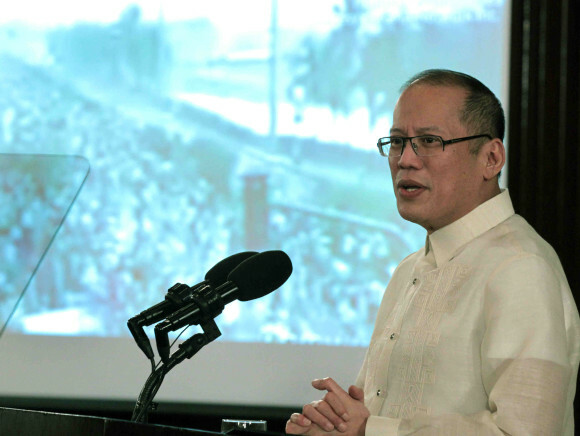 President BS Aquino announces security preparations for the papal visit with the marquee message of fear over hope. Photo from the Official Gazette. The “kapraningan” is at its most extreme when authorities asked the public not to bring “bags and umbrellas” and long stretches of streets closed to all motorists and public vehicles. Never mind the pilgrims coming from all over the country. Never mind the sick, the elderly, the young who would surely bring their personal needs. Never mind if the weather bureau predicts possible rainfall due to a coming storm. Everyone had to obey the law enforcers about these “security precautions”, however totally unreasonable. The impression is that, aside from being fearful, the authorities and law enforcers are only protecting the pope and treating everyone else with suspicion. The authorities’ “usual suspects”, the stridently pro-poor activists, are organizing an alternative Papal welcome – “salubong ng mamamayan”. If we go by the youth action held Wednesday outside UST, the activists are respectful and go by the expected decorum of the Papal visit. 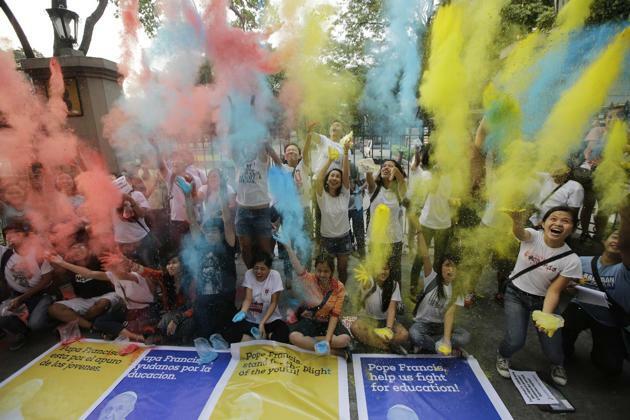 No red graffiti for the pope — only colored powder thrown in the air to symbolize the many national and sectoral concerns they wish Pope Francis would address. Even the Communist Party of the Philippines is hooked by the Pope Francis-mania. Early on, CPP founder Jose Maria Sison said the revolutionary forces are one with Filipinos in welcoming the pope who he described as a “progressive”. The CPP in fact has declared a unilateral ceasefire for the entire duration of the Papal visit, calling on the New People’s Army and the people’s militia to take a defensive position and be in solidarity with the multitudes welcoming the pope. Funny, fun Francis: Pope Francis in his previous visit to Korea. Photo from asianews.it. The Aquino administration may know more than the rest of us, but that does not give them a license to mess with the Papal visit with its brand of jittery, overboard, unreasonable, and crazy security preparations. Yes, it has the duty to protect the pope, but it also has the obligation to make sure the throngs of citizens seeking to see him could do so unimpeded by the security preparations and being shown the quickest, most convenient way to the venues. The entire machinery of state is at the disposal of the President who could order as much covert action as possible so as not to dampen the mood, not to terrorize the public and not be the party pooper. It should be told that its tense and cuckoo security preparations does not reflect positively whether nationally or internationally. Paranoia is not any good, especially if it is publicly displayed. If this is the state of mind of the President and his administration, they could keep this to themselves, work quietly and discreetly, and let the public mount the biggest fiesta for Pope Francis. Come to think of it, Pope Francis is the first and perhaps biggest guest ever in this “Visit the Philippines Year 2015”. We have a choice what to show him: Praning or piyesta. The President has made his choice, the people too have made theirs.